We've been working on quite a lot of improvements for both our iOS and Android apps. The most exciting one is a new board concept that we've introduced in our latest iOS release (v.3.6). The beta release of this board focuses on navigation, and includes the ability to swipe between columns. Lanes will always have visibility because they stick to the header. Quick Add and Drag-n-Drop are absent in the current realization, but we will be adding them soon. If you want to share your expressions or fears about the new board concept, just let us know at mobile@targetprocess.com. The enhancements below apply to both our Android and iOS applications, unless otherwise specified. For those who need the possibility to look at items related to an entity, we've added a Relations list to the entity details view. Relations are divided into Inbound and Outbound lists. If you're not sure why certain cards or lanes are not being displayed on a view, we’ve added the possibility to inspect view configuration. 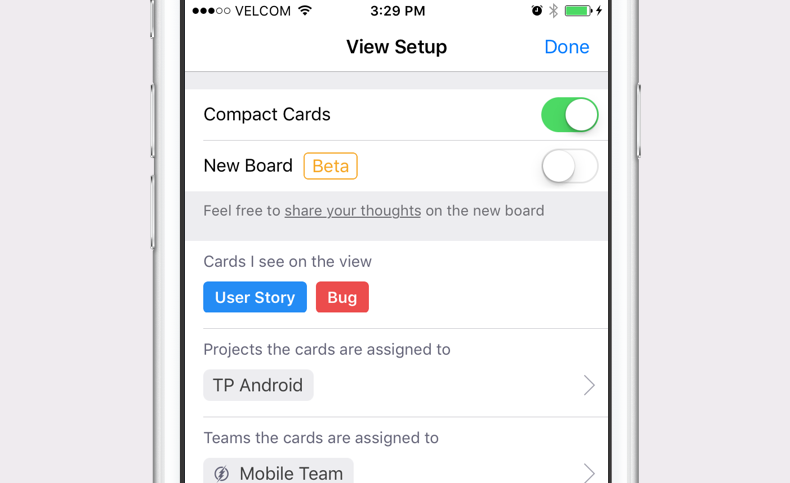 View setup is in read-only mode, but you can reset your personal Project and Team filter. Adding a new entity is now easier on our Android app, as you can add cards from the appropriate inner list. You don't have to search for Project or Team – they are preset from the parent entity. We've had some complaints about the inability to switch off notifications directly from the app. You can now do this by tapping the 'Mute' button that is located in the 'Notifications' tab. Added new actions for comments: Reply to, Copy text, and Delete. Long-press on a comment and select what you need. Extended the Add tab in Android with all existing entity types. Added missing fields into the entity details view.